John Reid holds degrees from Oxford University (BA), Memorial University (MA), and the University of New Brunswick (PhD). He has been a member of the History department at Saint Mary’s University since 1985, and has held the rank of Professor since 1989. He is also a former Coordinator of Atlantic Canada Studies at Saint Mary’s, and is currently Senior Research Fellow at the Gorsebrook Research Institute. He is a Fellow of the Royal Society of Canada, elected in 2004. Reid’s principal teaching and research interests include the history of early modern northeastern North America (focusing especially on imperial-Indigenous relations), the history of Atlantic Canada, the history of higher education, and the history of sport. He has published books and articles in these areas, as well as writing two historical novels for teenage readers and two plays for radio. 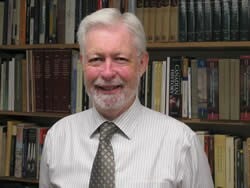 Reid has served on the Council of the Canadian Historical Association and on the editorial board of the Canadian Historical Review. A current board member of three historical journals, in 2015 he completed a six-year term as Co-editor of Acadiensis: Journal of the History of the Atlantic Region. He is also founding Co-editor of the University of Toronto Press monograph series on the History of Atlantic Canada. Among other international activities, in 2008 he held the Shastri Indo-Canadian Institute (SICI) Visiting Lectureship in India. Subsequently appointed as the Saint Mary’s representative to the Canadian Member Council of SICI, he became the organization’s Vice-President/President Elect in 2018.